Design Your Own Street – Central Ave.
Our post yesterday set the stage well for this post, which will allow the reader to choose street space priorities on his or her own. Though this was posted a couple of months ago on Atlantic Cities, this neat application is especially relevant as the Central Ave. complete street plan moves forward. The Central Ave. redesign process (or any street redesign process) is contentious as there is limited right of way, or ROW. Up until the project breaks ground and even after, people will debate the best and highest use of the limited ROW available, especially between I-25 and University. It may seem obvious to us what the best use of the space is but it’s helpful to see what other citizens think about the matter. 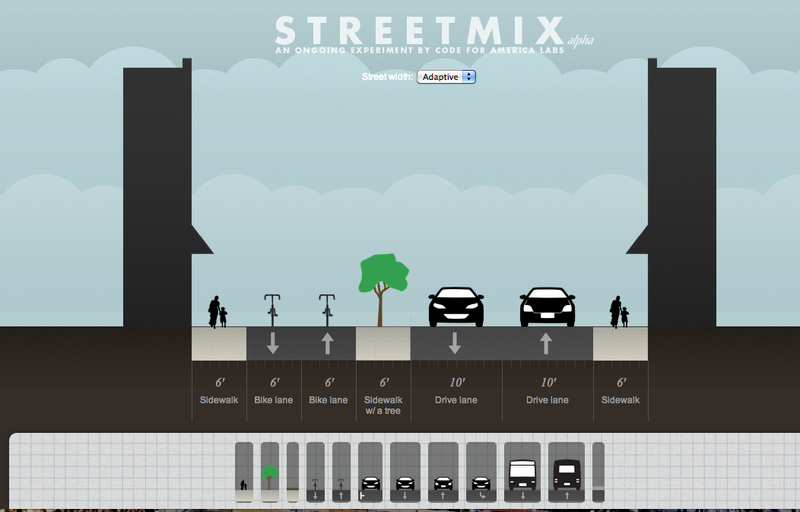 Streetmix allows the planner, citizen and any other interested party to truly feel out the options. It allows one to see how many feet of ROW each mode uses. 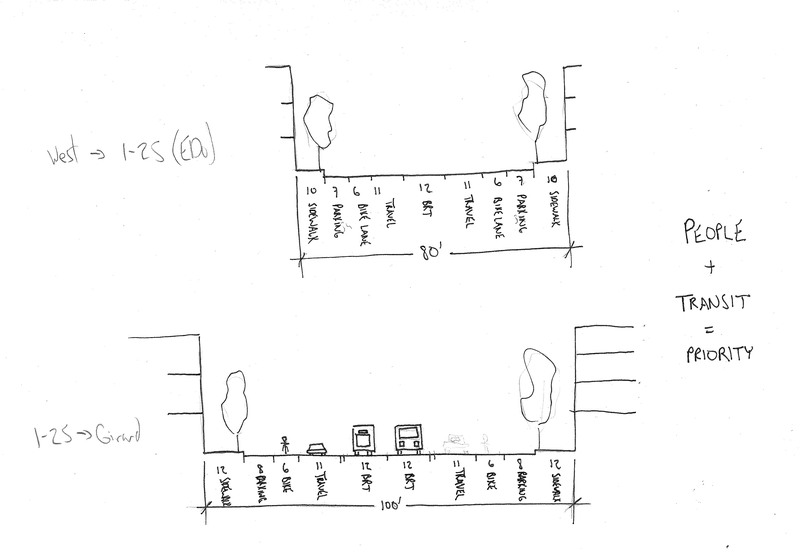 Here is the approximate available ROW on Central Ave. where this redesign process will be happening. Between Broadway and I-25 (EDo) –> 83 ft. Between I-25 and University –> 96 ft. Between University and Girard –> 115 ft. The challenge: how much can you squeeze in? BRT (bus rapid transit) lanes? Bike lanes? On street parking? EmX in Eugene, OR, a prototype for aspiring BRT systems. Albuquerque is setting the course for a BRT network, with Central Avenue as the backbone. Some argue that streetcars and light-rail are better but they often have no supporting evidence. First of all, BRT and streetcars are technologies intended for different contexts – the latter is for local service. However, when LRT and BRT are compared, research points to the two having equivalent effects on development. The keys are really in the land use policies and station area design. This brings me to the current Central Avenue Complete Street Plan being undertaken currently, spanning the area between Girard and 1st Street. This stretch of Central connects the UNM/CNM area with downtown, making it possibly the most important stretch of road that requires the right balance to be a successful multimodal corridor. Without getting into the details of what exists today, I want to argue that it is imperative that the City choose to prioritize non-auto modes over the automobile when applying a design along this stretch of Central Avenue. The chosen design will either maintain the maximum number of travel lanes (the four that currently exist), to the detriment of pedestrian, bike, or on-street parking. Or it will make a stand (a huge statement in our car-obsessed city) and choose sidewalks, bike lanes, and on-street parking, while eliminating a single lane of travel in each direction in order to accommodate dedicated BRT lanes. The worst thing the City can do is to not take a stand on the issue and force buses to merge with automobile traffic. However, such a compromise would be about par for the course. Reliable, rapid transit is the key here as it is vital to leveraging such an investment to maximize on social and economic benefits. If we have learned anything in planning and urban design over the last decade, it can be boiled down to the statement (and I can’t remember who said it first): when we plan for cars, we get cars. When we plan for people, we get people. Our City is obsessed with designing for efficient automobile flow. As a result, we have streets that are downright inhospitable to pedestrians and bicyclists. We also have excessively high rates of pedestrian-vehicle accidents and fatalities. I think it’s time to do things differently. Quick sketches for possible ROW design along Central. Though Albuquerque was not mentioned in this short Streetfilms video, the national trend is clear: for the first time since the mass production of the automobile, Americans are driving fewer miles per year. This has been going since before the Great Recession. Record ridership on ABQ Ride would lead one to believe that this trend holds true in Albuquerque. However, local (and federal) transit funding has remained stagnant. Hopefully, city and regional leaders will notice this trend before they build too many more multi-million dollar interchanges (I’m looking at you Paseo & I-25). I encourage you to send this video to elected officials or friends who you feel should see it.